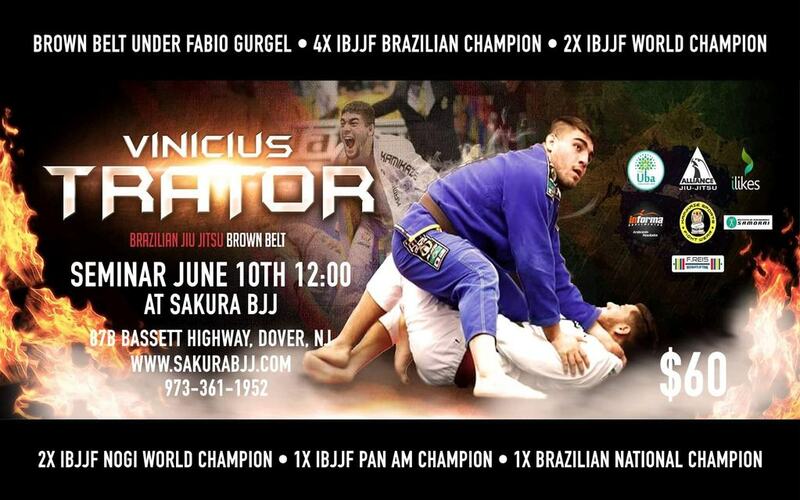 Vinicius Trator Ferreira BJJ Seminar at Sakura BJJ in Dover NJ! This event is sure to sell out quick! Click “Add To Cart” to sign up now! Vinicius Trator Ferreira is known as a Brazilian JiuJitsu phenom and even has DVD’s out which train lower belt levels some serious techniques to improve your BJJ game. You are sure to see and learn some of these incredible techniques at this rare BJJ seminar! Reserve your spot for the B.J.J seminar on June 10th, 2018 with Vinicius Trator Ferreira in Morris County, New Jersey at Sakura Brazilian Jiu-Jitsu.